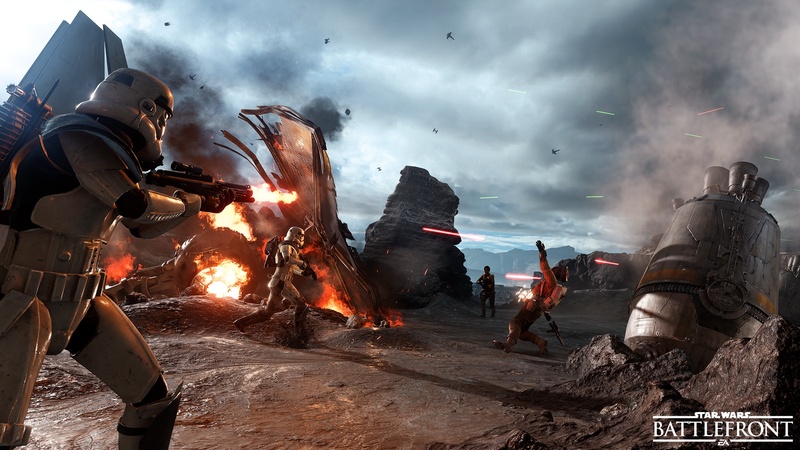 DICE’s open beta for Star Wars Battlefront is arriving in October. Gearing up for the November release of the game, EA has announced that Star Wars Battlefront’s first open beta will be held a month early on October 8th. Designed to give players a chance to experience the enhanced gameplay and all new Companion Experience, in addition, the developers at DICE and EA will be able to also see how well their servers hold up to rabid fan gaming. The beta is set to include three different game modes, spread across the planets of Hoth, Tatooine and the new volcanic planet Sullust. Walker Assault mode will be exclusive to the planet Hoth and lets players experience the expansive planet in 40 v 40 combat. Drop Zone will be available on Sullust, where players fight to control random areas on the map in 8 v 8 gameplay. Only available on Tatooine will be the new survival mode in which gamers will play split-screen or online co-op against hordes of Imperial or Rebel soldiers. In addition to all of this is the brand new Companion Experience, an all new gameplay mechanic outside of the actual battles in which gamers use strategic card based gameplay to upgrade their base commands. The new game mode will be available alongside the beta and allows players to earn credits, the in-game currency of the Star wars universe which can be used to unlock abilities, weapons and more. Gamers worldwide are hotly anticipating the new Star Wars Battlefront title, but luckily they’ll only have wait a few more weeks to get ahold of the first open beta when it becomes available on October 8th through the 12th on the PC, PS4 and Xbox One. Kyle is a Senior Editor here at GamersPack. He's been playing since the 90's and enjoys bringing people the latest news and reviews. He also co-hosts many of our Twitch streams and YouTube videos.